TNNA Market is done. I sat glued to my computer watching the posts from those who were able to make it this year. Still a lot of information to find out and then the decisions. I have great news!! Meredith Willet has agreed to teach at my retreat this year. It is scheduled for Columbus Day Weekend — that’s October 10, 11 and 12. Three glorious days to stitch with Meredith guiding us through the different canvases that are chosen. Call or email me at needlepoint at needlepointetc dot com for information. I have already started a waiting list but you never know. 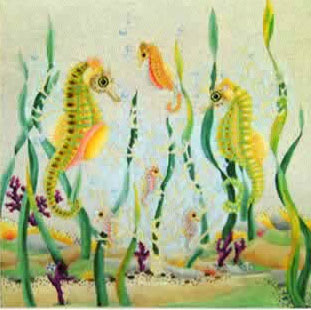 I have been narrowing down my choices — finally decided on Dede’s Seahorse Pillow.